Faster, Easier and Less Expensive than Old-fashioned Plumbing Methods. The evolution of plumbing has given rise to PEX as a new standard in construction. Whereas traditional copper supply lines still provide a very strong, reliable connection for water lines, the metal is much more expensive to purchase and more time-consuming to install. PEX supply lines offer a comparatively easy-to-install solution, and the material cost is much less. For these reasons, professional contractors are using PEX more and more, and do-it-yourselfers can take a cue from the pros. “Builders around here have pretty much moved exclusively to PEX for new construction,” says Richie Hamilton, professional builder/remodeler in Birmingham, Alabama. “Since copper is so expensive, a lot of contractors have problems with thieves breaking into homes under construction and tearing the copper right out of the walls to get the salvage cost.” This means not only are those contractors forced to replace the high cost of copper, but also forced to spend time, money and labor on reinstallation—not a good prospect for a builder’s bottom line. 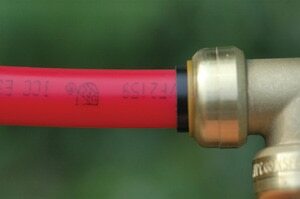 PEX is cross-linked polyethylene pipe. It was developed in the 1960s and introduced to the United States in the ‘80s. After under-going several manufacturing processes, the material becomes resistant to extreme temperatures (hot or cold). It also resists deformation from long-term exposure to stress, as well as chemical attack from acids and alkalis. PEX is flexible and suitable for use in temperatures below freezing and up to 200 degrees Fahrenheit. This makes PEX an excellent piping material for hot and cold water potable water systems, as well as radiant heat flooring. Its flexibility is one of the major advantages of PEX. When running supply lines through a stud wall, PEX is easy to thread through the stud holes without binding against the wood, as a rigid copper pipe can do. When a pipe reaches a corner, a copper pipe must be cut, then fitted with a 90-degree elbow, fluxed and soldered, and then joined to a second length of pipe using the same soldering process. 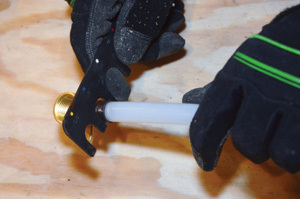 With PEX supply line, simply bend the flexible pipe through the corner studs—no joint is necessary. Fewer joints save time, which can bring down costs for the contractor and the homeowner. Fewer joints also mean less chance of a leak. PEX is available in 1/4- through 1-inchsizes, and the material’s flexibility allows it to expand and contract to reduce the risk of a burst pipe. Furthermore, flexible systems are quieter than rigid piping. On top of all this, a PEX system has a shutoff valve at each supply line. This makes it more convenient to cut off the water supply when making repairs or working on plumbing fixtures. Note: PEX tubing is approved in all the current model-plumbing codes, but some jurisdictions may not have amended the code to include PEX tubing. Contact the local authority with jurisdiction over plumbing to verify the acceptance of PEX tubing for plumbing applications in your area. 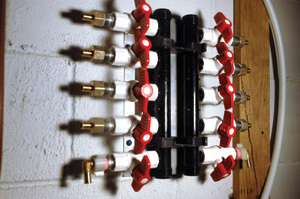 Shown is a PEX manifold built by the EHT staff during a recent bathroom addition. 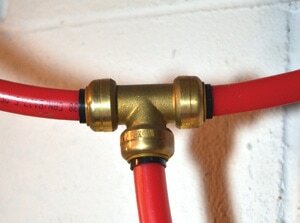 The manifold allows different lines of the pipe to be shut-off for easy maintenance or repairs. All this love for PEX doesn’t mean the world doesn’t still love copper. If copper wasn’t such a hot commodity, the material wouldn’t be so expensive, and thieves wouldn’t target it. Copper has been used as a plumbing material for decades and has proven to be durable, resistant to bacteria and—when compared to iron pipes—relatively easy to install. Copper resists corrosion and is also unaffected by ultraviolet rays, which is one advantage copper has over PEX. The PEX material can deteriorate in the presence of the sun’s ultraviolet rays, which is why PEX should not be used in exposed outdoor applications. Copper is also recyclable. PEX is not. This makes copper the more sound environmental choice for the green-minded homeowner. To determine a price comparison between the two materials, I took a trip to my neighborhood Home Depot to see what was selling. At the time of publication, 10 feet of 1/2-inch Type M copper pipe (the type typically used for water lines) sold for $11.81, which equates to $1.18 per linear foot. On the other hand, a 50-foot coil of 1/2-inch PEX pipe sold for 13.96, which equates to only about $0.28 per linear foot. All PEX connections begin with a good, square cut on the pipe end. Here we’re using the new Milwaukee12V pipe cutter. Currently three different techniques are available for installation of PEX plumbing systems. Push-fit Connections. Soldering copper pipe requires hand tools such as a propane torch, a flux brush, a pipe-cleaning tool and a pipe cutter. It’s a time-consuming process. However, copper pipe can also be installed with the same modern push-fit connections that work with PEX and CPVC. For new installation and repair of potable water supply lines, push-fit connections provide a quick way to join pipe, requiring no soldering, clamps or glue. 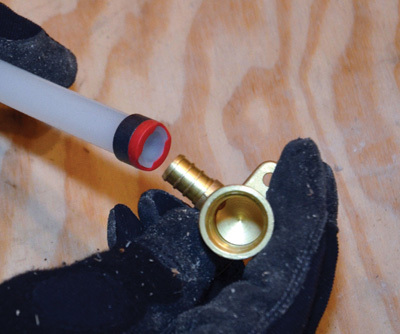 Push-fit connections utilize a compression fitting to join the pipes, and are certified up to 200 PSI and 200 degrees F. Installation of these fittings is super simple, paving the way for all manner of DIY applications. To make a push-fit connection, first make a square cut on the end of the pipe. Sand down any rough edges or debris. Mark the depth of the pipe that will be housed in the push-fit connection. Push the fitting together up to the depth mark so it “clicks,” and like magic the connection is complete—it takes all of 3 seconds. The combination of push-fit fittings, manifolds, valves and PEX tubing is the fastest way to plumb virtually any residential project. After making a square cut on the pipe, mark the depth of the pipe that will be housed in the push-fit connection. 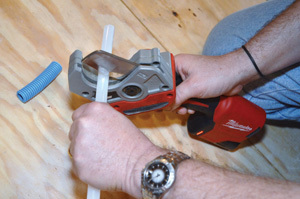 Push-fit connections provide the fastest and easiest method to connect PEX, copper or CPVC pipe. Some push-fit connections include a reinforcement ring to be placed inside the end of the pipe, so the pipe end retains its round shape as the connector crimps over it. When the pipe is pushed into the fitting, the stainless steel teeth of the fitting bite down on it and grip tight, while a specially formulated O-ring compresses to create a perfect seal. Here’s how it works: When the pipe is pushed into the fitting, the stainless steel teeth of the fitting bite down on it and grip tight, while a specially formulated O-ring compresses to create a perfect seal. Disassembly is just as fast using a simple disconnect tool that releases the O-ring, so fittings and valves can be easily changed and reused. They can even be rotated after assembly for easier installation in tight spaces. 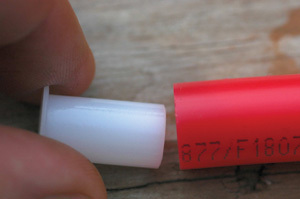 The push-fit connections are permanent connections, some of which come with a 75-yearmanufacturer’s warranty. Push-fit plumbing connections come in sizes ranging from 3/8 to 1”, available as couplings, elbows, tees, connectors, reducers and end stops. Push-fit plumbing connections come in sizes ranging from 3/8 to 1 inch, available as couplings, elbows, tees, connectors, reducers and end-stops. The products are marketed under a couple of different brand names, the most prevalent being Shark bite from Cash Acme, a company based in EST’s home state of Alabama (www.cashacme.com). Expansion Fittings. 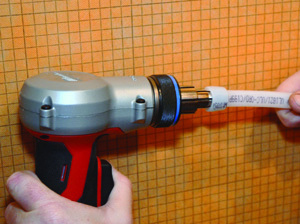 The expansion-fitting system makes plumbing connections utilizing PEX rings that are threaded over a pipe end and then expanded with a special tool. The expanded ring then contracts/compresses on plumbing fitting to form a very strong, reliable connection. The expansion system manufactured by Wirsbo is probably the most widely used PEX connection system by professionals in the US. In the past, the primary disadvantage to this system was the high up-front cost of the Wirsbo ProPEX expansion tool (from $675 for air-powered model to more than $1,000 for a lithium-ion version, with the expander heads sold separately). The cost of the Wirsbo fittings was also high, and the manufacturer wanted only professionals using the tools—tough luck for DIY’ers. To make a connection with an expansion fitting, first thread the expansion ring over the pipe end until it meets the inner ridge. Then insert the expansion tool into both the ring and the pipe end. However, Wirsbo has now made available engineered plastic fittings that are more cost effective, and Milwaukee Electric Tool now offers both 12- and 18-volt versions of the ProPEX Expansion Tool at a much more affordable price point than previously available (the 12V sells online for less than $200). The cordless Milwaukee Expansion Tool features an auto-rotating head for one-handed operation, a compact right-angle design, and a quick-cam mechanism that delivers precise, continuous expansion for 3/8- to 1-inch ProPEX connections. 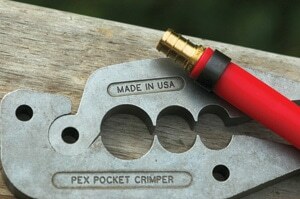 Milwaukee’s Expansion Tools are designed specifically for Upon or ProPEX tubing. 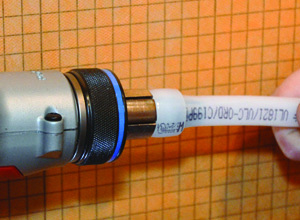 Insert the plumbing fitting into the expanded ring/tube and the PEX material will contract to achieve a strong connection. When the tool is triggered, the cam mechanism delivers continuous expansion to the ring and the PEX tubing. Barb Fittings. 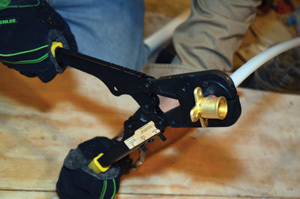 Predating the new push-fit connections, a more traditional method for connecting PEX systems (not specific to Wirsbo) utilizes a crimping or clamping tool with barb fittings and “crimp” or “clamp” rings. Whether you’re “crimping” or “clamping” depends on the type of tool and ring used—the methods are very similar but not exactly the same. Although installation is notes fast as using the push-fit system, this older method still makes sense when the price of materials takes priority, as the combination of PEX manifolds, barbed fittings and crimp rings offers the lowest total material cost. For a frugal method of PEX installation, the combination of PEX manifolds, barbed fittings and crimp rings offers the lowest total material cost. To make a crimp/clamp connection with barb fitting, first make a good, square cut on the tube end. 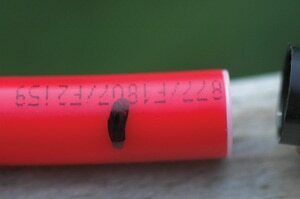 Slide the correct size ring over the tube and roughly 2 inches past the end. Push the tubing onto the barbed plumbing fitting until it touches the shoulder. Position the ring 1/8 to 1/4inch from the end of the tube, which ensures the ring is positioned directly over the barbs on the fitting. Position the jaws of the crimping/clamping tool over the raised tabs of the ring and squeeze. 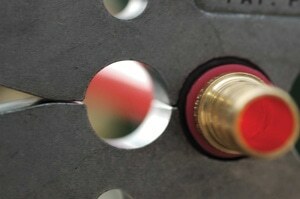 The connection compresses the tubing between the ring and the barbs for a secure connection. 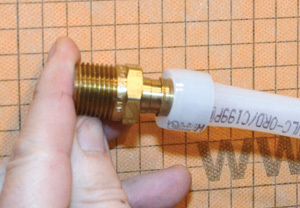 To make a connection with a barb fitting, slide the correct size ring over the tube and past the end. Push the tubing onto the fitting until it touches the shoulder. Position the ring 1/8 to 1/4 inch from the end of the tube, over the barbs on the fitting. Position the crimping/clamping tool over the raised tabs of the ring and squeeze. You can then check your connections using a simple slotted hand tool appropriately dubbed a “go/no-go gauge.” The gauge slot that corresponds to the crimp/clamp ring size should easily slide onto the compressed ring. 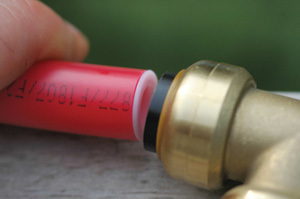 You can then check barb-fitting connections using a “go/no-go gauge.” The gauge slot that corresponds to the crimp/clamp ring size should easily slide onto the compressed ring. A variety of crimping/clamping tools are available from different manufacturers. For today’s homeowners and professionals, PEX simplifies plumbing installation. For big projects and small, these systems require less time and labor to install. And, given the high cost of copper, PEX offers significant savings as a plumbing material. Given this winning combination of features, PEX is well worth a look when you approach your next plumbing project. Editor’s Note: Special thanks to PexSupply.com for help with the article. Visit www.pexsupply.com or call 1-888-757-4774.